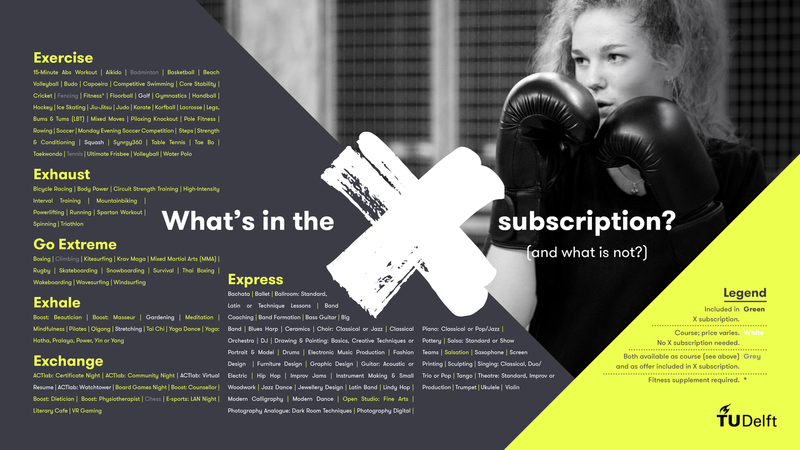 As of 20 August, X introduced a single, general subscription: the X subscription. On top of that, you can buy a Fitness supplement to make use of the fitness facilities. Want to take part in our courses? You don't need an X subscription, just to enrol for the course itself. Each course has its own price. You can find these prices on the specific page of the offer itself. Enrolment is also possible via these pages or via the online schedule. For members of associations who are part of X, it is mandatory to buy an X subscription for 12 months. With an X subscription you can participate in all ticket hours without limitation, it provides for free attendance at virtually all events and – on an individual basis – free use of all new facilities! Please note: When ordering a subscription, you need to have a campus card and a valid proof of enrolment. In order to make use of our fitness facilities, you need the Fitness supplement. This is supplementary to the X subscription, so you will need a valid X subscription as well as the fitness supplement. 1. Students rates apply to: all WO and HBO students, PhD TU Delft, IHE Delft and registered partners of aforementioned. 3. Off-peak hours: during the week from 07:30 to 16:30, on weekends and during the summer period (July and August). 4. Off-peak hours: during the week from 07:30 to 19:30, on weekends and during the summer period (July and August). all forms of free practice. Free practice sounds a bit vague; basically, it means that it is possible to, for example, play a game of basketball with friends, to grow strawberries in one of the garden plots of the Campus Farm or to play games in one of the new VR booths. Moreover, all practice rooms (except band rooms) can be booked if they are free; a separate culture subscription was previously required to use them. The culture subscription will disappear, just like the sports card. The courses and projects of the former Unit Sports and Unit Culture are not included in the X subscription; they each have their own registration rate. You do not need an X-subscription to participate in these courses and projects. Flexible activities, such as events, can also be attended without an X subscription. Sometimes flexible activities can be attended free of charge and sometimes they must be purchased. In many cases, non-subscribers pay more than those with an X subscription.